Mati (Sophie Stockinger) is a sullen 17 year-old reaching the end of high school. She spends her time away from school either assisting in her mother’s veterinary surgery, or hanging around with a group of rebellious boys on motorcycles. One of the boys, Sebi (Jack Hofer), has romantic aspirations. Mati’s eyes, however, are on Carla (Julia Franz Richter) – a young woman who has brought her injured cat into the vet surgery. 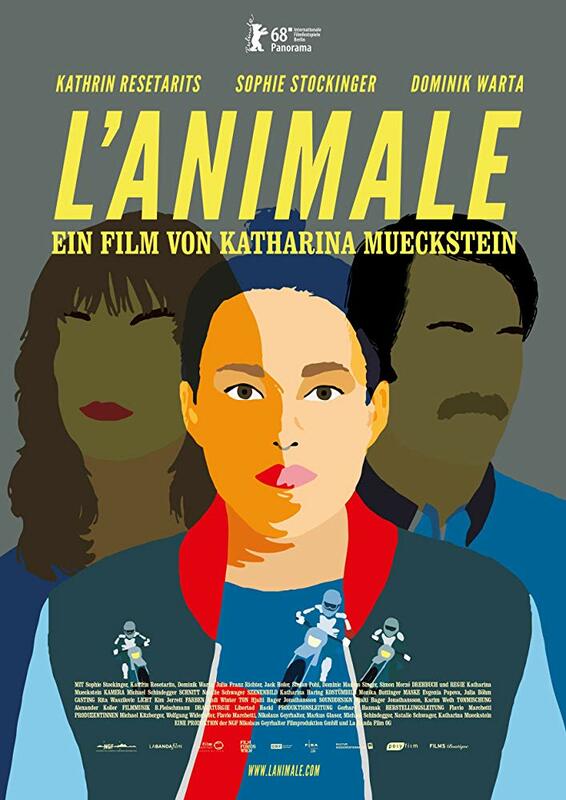 Austrian filmmaker Katharina Mückstein makes her second feature with L’Animale: a traditional but well-presented coming-of-age drama. Mati is gay, but has not quite worked it out for herself. Furthermore, she is on the cusp of adulthood and has outgrown the vandalism-and-harrassment-happy motorcyclist that she considers her friends. Mückstein captures her central character brilliantly, and Sophie Stockinger delivers a particularly strong and heartfelt performance. Mati is an imperfect woman, and rather than repair her the film is more about letting her find a new direction in life. To a large extent the film conforms to the standard model of small town drama: high school boys are horny, high school girls are mean, husbands cheat on their wives, and whatever you’re studying in your literature class will have a startling relevance to your own small town troubles. It is all familiar enough to risk making L’Animale a little bit underwhelming. The bottom line is that we have seen almost everything the film has to offer many times before, and while Mückstein does an excellent job of staging the story – the cinematography and electronic musical score are both superb – this is still a by-the-numbers teenage drama. It also seems form part of a growing trend in LGBTIQ cinema, in which the generic romance gets re-made through a queer lens but with very little else interrogated or transformed. On the one hand it is entirely appropriate for the LGBTIQ community to have its day in the sun with traditional narrative romance. On the other hand the sense of transgression and moral challenge that made so many older queer films stand out is getting lost. It feels a little too much like conforming to me – but then I am neither an authority of queer cinema, nor these films’ target audience. A sub-plot involving Mati’s closeted gay father Paul (Dominik Warta) does goes some way to making the film more interesting, but feels curiously unresolved. Moments of genuine inspiration are peppered through the film, whether it is a smart lift from Paul Thomas Anderson’s Magnolia or a clever edit from Mati and Carla, backed by warm heartfelt electronica, to a resentful and single Sebi, backed by a much harsher soundtrack. It all points to something more ambitious just out of view, and makes me very keen to see what Katharina Mückstein directs in the future. If there is a serious fault to L’Animale it is that the talent it displays, both in front of and behind the camera, suggested a much better film given a little more time and inspiration. What is presented is hugely entertainment and emotionally effective, but you sense it could have been something more. A case of very good, but I wanted great.